John Andrew Howard Ogdon (January 27, 1937 – August 1, 1989) was an English pianist and composer. Ogdon was able to play most pieces at sight and had committed a huge range of pieces to memory. He intended to record the complete piano works of Sergei Rachmaninoff, a feat which would constitute about 6-full length CDs, but only recorded about half of them. The recordings were released in 2001. 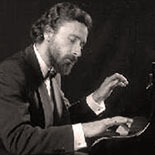 He recorded all ten Scriabin sonatas early in his career. Ogdon was also a formidable exponent of the works of Alkan and Busoni. In more familiar repertoire, he revealed deep musical sensibilities, always buttressed by a colossal technique. He also recorded a number of duo-piano works with his wife, Brenda Lucas, also known as Brenda Lucas Ogdon. His own compositions number more than 200, and include 4 operas, 2 large works for orchestra, 3 cantatas, songs, chamber music, a substantial amount of music for solo piano, and 2 piano concertos, the first of which he recorded. The majority of his music was composed for the piano. These include 50 transcriptions of works by composers as diverse as Stravinsky, Palestrina, Mozart, Satie and Wagner. He also made piano arrangements of songs by Cole Porter, Jerome Kern and George Gershwin and he wrote unaccompanied sonatas for violin, flute and cello. A planned symphony based on the works of Herman Melville, and a comic opera were left unfinished. The original manuscripts of many of John Ogdon’s compositions are deposited in the Royal Northern College of Music Library.